Steelcase, the global leader in office interiors, has today announced the UK launch of three new technologically integrated products. media:scape mini: The new mini version of media:scape extends collaboration into smaller and existing spaces. 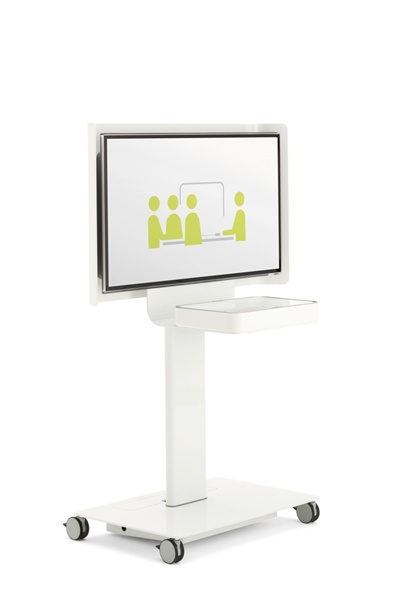 media:scape mini can be placed on top of any surface transforming ordinary spaces into high-tech collaboration hubs. media:scape mobile: Steelcase have made media:scape more compact and portable. media:scape mobile can be moved around the office to facilitate collaboration wherever you need it. Ideal for smaller companies that do not have the space for the full unit, as it can be stored out of the way when not in use. FrameOne bench with integrated media:scape technology: One of Europe's most popular benches has been updated to integrate video technology into the bench itself, allowing teams of up to eight people to share information quickly and seamlessly, enabling faster innovation and collaborative thinking. As with the original media:scape, each of these products can be upgraded to integrate video-conferencing technology, turning any space into a high-definition tele-presence suite. Kim Williams, Northern Europe Product Marketing Manager, said: "We are really happy to now offer these extensions of the media:scape line and the integrated technology is really impressive. Organisations are increasingly becoming globally integrated, which means work is more distributed and collaborative - these products can help that happen anytime, anywhere." As a family of products, media:scape brings together people, space and information to boost collaboration and help teams excel. media:scape augments how teams collaborate, allowing participants to access and share their digital information equally, quickly and seamlessly in person or via high definition videoconferencing. The launch event is taking place tonight, and will also feature a talk by Allan Smith, Steelcase International's VP of Product Marketing and Applications, on the rise of video technology in the workplace. For further information please contact Chessie da Parma at Media House international on 0207 710 0020 or [email protected]. media:scape originally launched in 2008 as a complete application that merges furniture and technology, allowing users to collaborate and share information seamlessly by connecting their laptops to built-in PUCKs. In 2009, the product was updated with the high-definition videoconferencing feature. For 100 years, Steelcase has been bringing human insight to business by studying how people work, wherever they work. Those insights and our solutions can help organizations achieve a higher level of performance by creating places that unlock the promise of people at work. Kim Williams, Northern Europe Product Marketing Manager, said: \"We are really happy to now offer these extensions of the media:scape line and the integrated technology is really impressive. Organisations are increasingly becoming globally integrated, which means work is more distributed and collaborative - these products can help that happen anytime, anywhere.\"